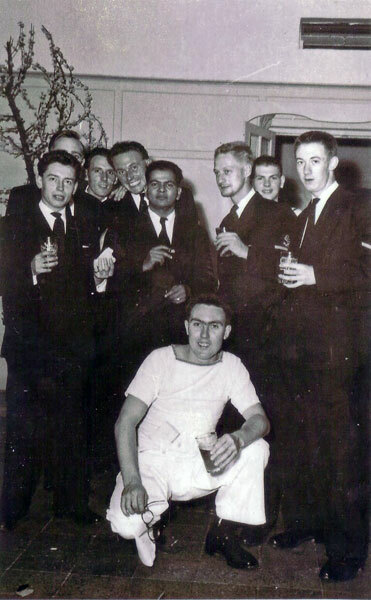 John was an ordinary seaman on HMS Gambia for the 1955/56 commission. John joined the Police force on demob and spent going on to 33 years in the service before retiring in 1987 reaching the rank of Superintendent. 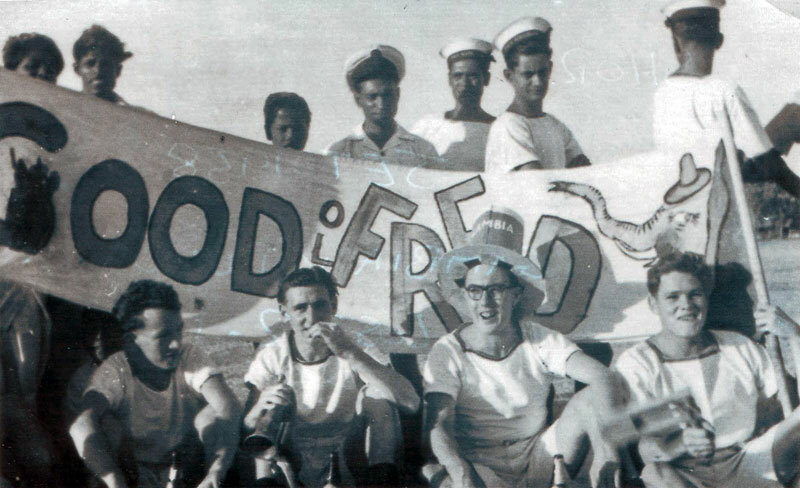 George served on HMS Gambia as Sick Berth Attendant during the 1957/58 commission. He passed away on February 10, 1959. Lewis, after prior service in the Royal Navy, joined the Royal New Zealand Navy on April 7, 1942 having settled in New Zealand. He was enlisted directly as an Able Seaman, and after basic shore training, was posted to the armed merchant cruiser HMNZS Monowai. 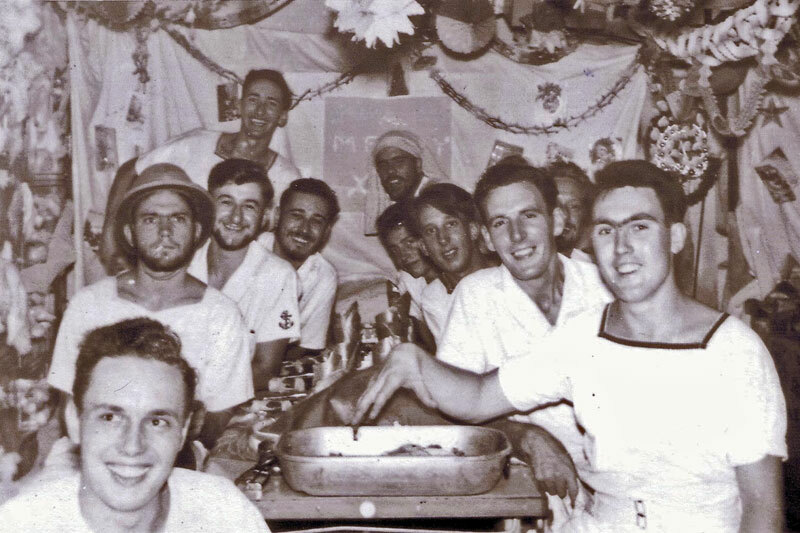 He was part of the ship's company during her transit to the United Kingdom in 1943, where he joined the cruiser HMNZS Gambia, serving on her till he left the navy after the end of the war. He was discharged on January 3, 1946. For his service he was awarded the Naval General Service Medal 1915-1962, 1939-1945 Star, Pacific Star, War Medal, and the New Zealand War Service Medal. Harry Anderson, service number C015645Y, served on HMS Gambia as Lieutenant Commander for the 1957/58 commission. Altogether he served from 1953 to 1987 nd the other ships/establishments he served on were HMS Fisgard (1953 - 1954), HMS Caledonia (1954 - 1956), HMS Gambia (1957 - 1958), HMS Bermuda (1959 - 1961), HMS Maidstone (1962 - 1963), RNEC Manadon (1964 - 1965), HMS Maidstone (1965 - 1967), FEC Rosyth (1967 - 1969), HMS Resolution (1970 - 1974), HM Naval Base Clyde (1974 - 1976), HMS Resolution	(1976 - 1980), HM Naval Base Clyde (1980 - 1983), and Fleet Maintenance East - Garden Island Dockyard (1983 - 1987). After his retirement, Harry moved to Sydney, Australia. Alexander was the son of James and Mary Andrew, of Dundee, Scotland. He died on June 21, 1945 aged just 30 and is buried at Waikumete Cemetery, Glen Eden, Auckland, New Zealand. John served as a Leading Stoker in Gambia from November 1958 until he left her in the reserve fleet in March 1961. He is (July 2017) the acting President and Social Secretary of the HMS Gambia Association. John was a Stoker 1st Class on HMS Gambia for the 1946/48 commission. He became a founding member of the HMS Gambia Association but passed away in September 2011. Cyril was born on April 6, 1928, the son of Roy Nelson Barnett and Clara Eyles. He served on HMNZS Gambia and the frigate HMNZS Hawera. He was the husband of Margaret, and father of David and Lynn. Cyril pssed away on May 12, 2007 aged 79. Eric served in Supply during the 1957/58 commission. I am not sure how Bill Hartland came by these photos. Bob's son, also called Bob, believes that his dad was ony 16 when he joined the navy. He passed away in 2006. Bill was born on March 15, 1922. He joined the RNZN in May 1940 and served on HMNZS Leander, HMNZS Achilles, and HMNZS Gambia. He was the husband of Vera, and the father of Karen and Trevor. Bill passed away on May 5, 2008, aged 86. Wattie was one of the shore party that took Yokosuka Naval Base, Japan in August 1945. In 2015, Wattie was living at Takaka, Golden Bay, New Zealand. 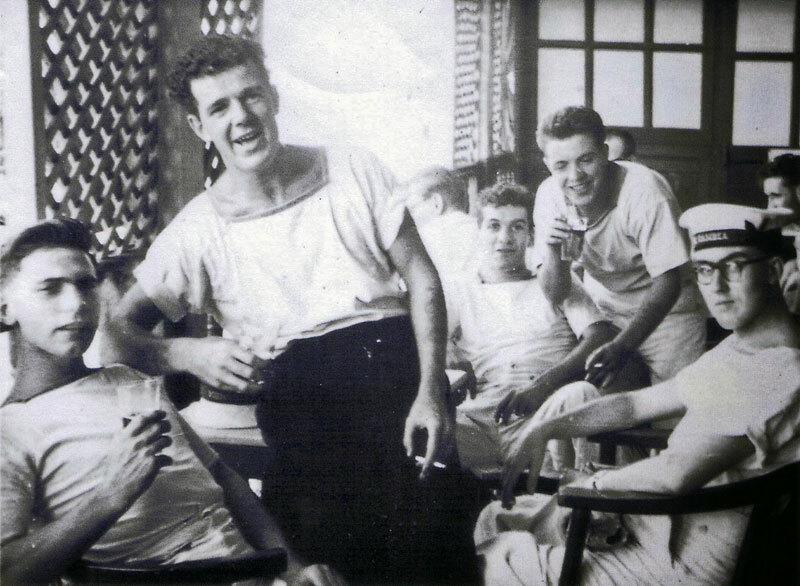 Alec was a stoker who served on HMNZS Gambia from 1943 to 1946. He was originally from Stoke on Trent, England and passed away in 1969. Branegan was an Electrician Sub Lieutenant on the 1957/8 commission. He was also a keen ornithologist or twitcher, at least he was interested enough to send reports to Royal Naval Birdwatching Society. In the December 1959 issue of The Sea Swallow he reported seeing various species of Cormorants, Frigates, Gulls, Noddies, Petrels, Shearwaters, and Terns on the commssion around the Indiana Ocean includingthe Arabian Sea, Persian Gulf, and Chagos, Mauritius, Reunion, and Sand islands. Anthony joined HMS Sandhurst as a NAAFI Boy in 1934, and finally retired from the RN on September 1, 1957. He spent just six weeks, from February to April 1950 on HMS Gambia, but had an interesting career. He was on HMS Bulldog when Commander A. J. Baker-Cresswell cptured U-110 and the Enigma coding machine it carried. His varied career is online in a Times of Malta, November 13, 2016 article, "Anthony Buhagiar – A Lifetime's Service with the Royal Navy"
Jack's service number was JX 316187 and he served on HMS Gambia from February 1942 until November 1943. He then served on HMS Pembroke and HMS Cubitt from November 1943 until January 1946. HMS Pembroke was a shore establishment at Chatham. HMS Cubitt was a frigate. Jack was also at HMS Cochrane, another shore establishment at Rosyth, Scotland. 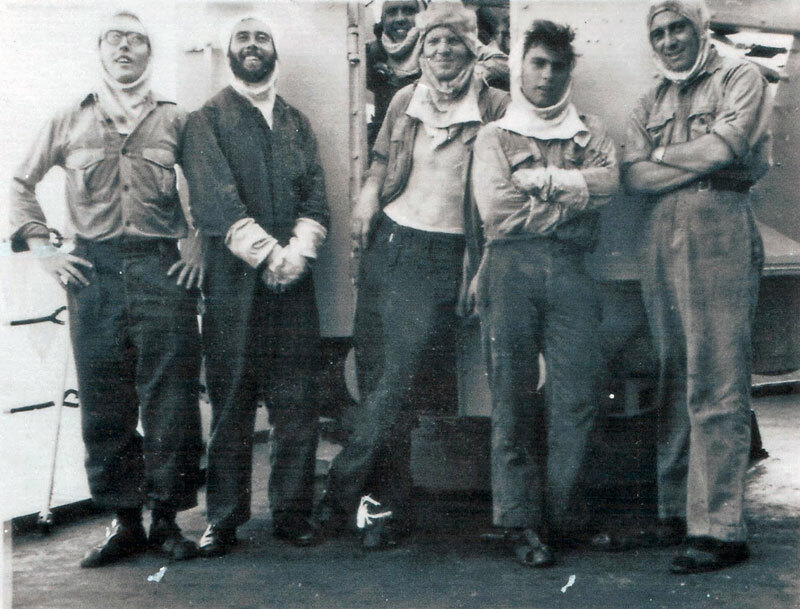 Thomas served on HMS Gambia as Chief Petty Officer Stoker Mechanic on the 1952 to 1954 commission. His service number was D/KX.80366. The London Gazette of 16 February, 1954 reported that "The Queen has been graciously pleased to approve the award of the British Empire Medal (Military Division) for distinguished service in the Greek earthquake relief operations in August, 1953" to him.